In via Cavour, only 50 meters away from the Imperial Forums, in the heart of ancient Rome, Hotel Solis boasts an excellent location, convenient to reach the Colosseum and well-served by the subway station to get to Stazione Termini trainstation. Choosing Hotel Solis means having Rome close at hand, with all its wonders and its contagious atmospheres that make famous squares and streets come alive such as via Vittorio Veneto, immortalized by the movie, La Dolce Vita directed by the master, Federico Fellini, via Margutta and the romantic Campo de’ Fiori. Just outside the hotel, the nearby via dei Fori Imperiali is a great place to go strolling towards Piazza Venezia where there's the Altare alla Patria (Altar of the Fatherland), one of the symbols of the Capital and of the entire Country. From here via del Corso takes you to Piazza del Popolo, through an area, almost entirely pedestrian, filled with shops, boutiques and restaurants. Hotel Solis is only 100 meters away from the Colosseum, while the famous Fontana di Trevi fountain and Piazza di Spagna are only 20 minutes away by foot. Once you're in the historic center be sure to visit Villa Borghese, Piazza Barberini, via Vittorio Veneto and Piazza Navona, Romes most symbolic places. For art buffs Galleria Borghese, the Gnam (Galleria Nazionale d'Arte Moderna e Contemporanea - National Gallery of Modern and Contemporary Art) and the Macro (Museo di Arte Contemporanea - Museum of Contemporary Art) have the most interesting collections and international reviews. It is the most famous Roman amphitheater, the ancient temple that held gladiator events of Imperial Rome, able to accommodate well over 50,000 spectators. Today it is one of the monuments registered in the Unesco World Heritage list, and a mandatory visit for every traveller, even more so if you're staying at the Hotel Solis because it is a short distance away. From the hotel a brief stroll along via Cavour will take you in the vicinty of the Fori Imperiali, a fascinating archaeological site that dates back to the 1st century BC. Still today strolling along its remains you can see the greatness of ancient Rome and of its age-old history, unveiling its ancient political, economic and religious center to visitors. A must see! One of Rome's major attractions is represented by the Vatican Museums where visitors can admire, in addition to an unlimited series of works of art, the extraordinary Sistine Chapel, the papal apartments filled with frescoes by Raffaello and the splendid Spiral Staircase by Giuseppe Momo. From the hotel the Vatican and San Pietro are only ten minutes away by car. Hotel Solis is located in the Monti district, one of Rome's historic neighborhoods, characterized by small streets going up and down on the hills of dell’Esquilino and of the Viminale. The area is known for its excellent restaurants and wine shops. In addition to good food, the Monti district is also known for its enviable architectural heritage: in fact here you will find the Mercati Traianei (Trajan's Market), the Basilica of San Giovanni, about thirty medieval towers and, of course, the Colosseum. The Nuova Fiera di Roma, showcase for Made in Italy products and state-of-the-art location for the international exhibition sector, is a regular destination for business clients staying in Rome. From Hotel Solis, the expo area is only half an hour away by car. You can also reach the area from downtown by taking the FR1 regional train, that departs from the Ostiense station, only 3 subway stops from the hotel. Once you arrive at the Stazione Termini trainstation of Rome take subway line B and get off at the ‘Cavour’ stop. Continue for about 350 meters towards the Fori Imperiali (Imperial Forums) and you'll see the hotel on your right. From the International Airport “Leonardo Da Vinci” of Fiumicino, take the Leonardo Express train for Stazione Termini. 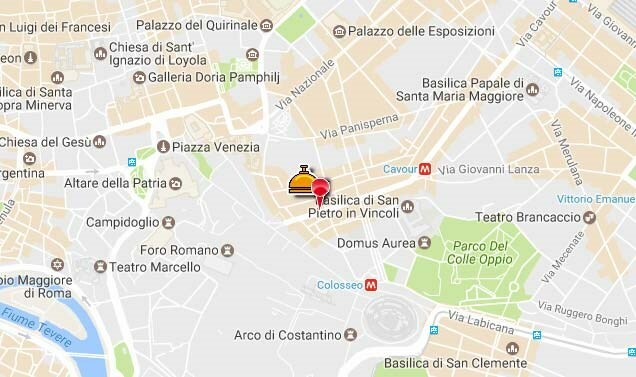 From there you can continue by taxi or take subway line B that will take you all the way to the ‘Cavour’ stop; the hotel is located on via Cavour, about 350 meters away from the subway station, towards the Fori Imperiali. From the Airport of Ciampino, instead, take one of the shuttle buses for Stazione Termini. From there continue as indicated above. You can also rent a car from one of the rental companies guaranteed by Hotel Solis. From the main highways get onto the GRA (Grande Raccordo Anulare) and follow the directions for the "centro" (downtown) and for Stazione Termini. From there continue onto via Cavour for about 1.5 km until you reach number 311. Hotel Solis is located on the right side of the street and ready to welcome you.